Texas' keel was laid down on 18 August 1973, at Newport News, Virginia, by the Newport News Shipbuilding and Drydock Company. 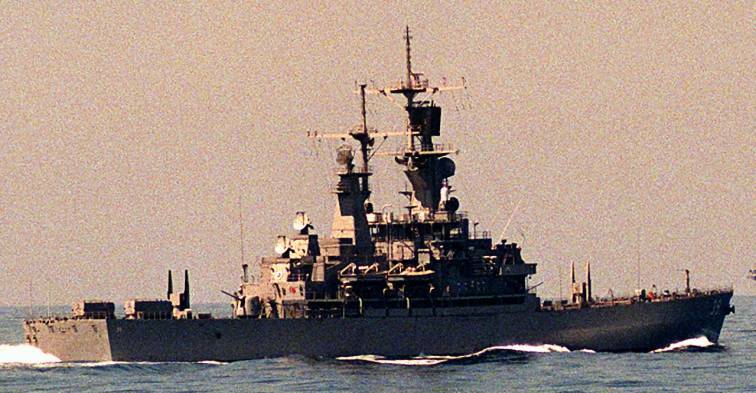 She was initially designated a guided missile destroyer leader, but was reclassified as a guided missile cruiser and given the hull classification symbol CGN-39 on 30 June 1975. She was launched on 9 August 1975, sponsored by Mrs. Dolph Briscoe, wife of the Governor of Texas, and commissioned on 10 September 1977, with Captain Peter B. Fiedler in command. Following a nine-week test of the ship's combat systems, Texas loaded weapons at the Yorktown Naval Weapons station in October and underwent refresher training out of Guantánamo Bay, Cuba, in November. 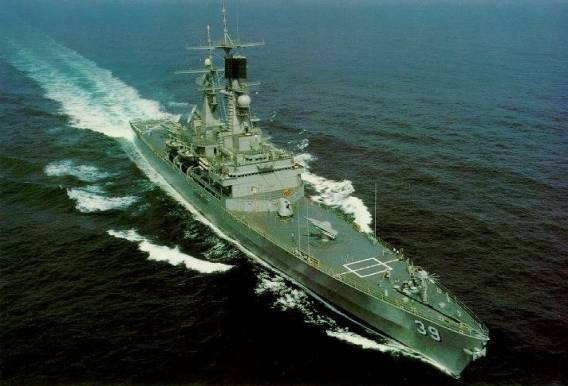 Texas spent the first three months of 1978 conducting at-sea evaluation of her propulsion and weapons systems off the Virginia Capes and in the Caribbean. On 28 March, she transited to her building yard at Newport News to commence a Post Shakedown Availability (PSA) which was completed on 31 July. The remainder of 1978 was spent in individual ship exercises off the east coast and Roosevelt Roads, Puerto Rico, interspersed with periods in Texas' home port of Norfolk, Virginia. The maiden deployment of the Texas was with the USS Nimitz Battle Group in the Mediterranean and North Arabian Sea during the Iranian hostage crisis. She also served as Flagship for Commander, Cruiser-Destroyer Group One. The second deployment of the ship was once again with the Nimitz Battle Group operating in the Mediterranean Sea. During this period, Texas saw combat for the first time, as she responded to Libyan aggression in the Gulf of Sidra. Texas' third deployment was with the USS Carl Vinson Battle Group, and included an around-the-world cruise which allowed her to visit every inhabited continent except South America and to sail all the oceans except the Arctic. The world cruise also included a change of homeport to San Diego, California, from Norfolk, Virginia. Texas spent the first part of the following year operating in the Persian Gulf and Arabian Sea before returning to San Diego. She then began to make preparations for a homeport change to Bremerton, Washington, for a Complex Overhaul. She entered dry-dock at Puget Sound Naval Shipyard in September, and remained there until April 1987. The overhaul lasted until April 1987, and included the installation of the Tomahawk missile system. Following a homeport change to Alameda, California, Texas deployed with the Carl Vinson Battle Group for Westpac 1988 as the Anti-Air Warfare Commander. This fourth major deployment included port visits to Singapore, Subic Bay, Hawaii. Thailand, and Kenya. 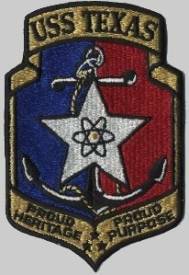 In 1989, the Texas conducted local operations and a short overhaul at Hunters Point Naval Shipyard in San Francisco. By the end of the year, she was back at sea on counter-narcotics operations off the coast of South America. 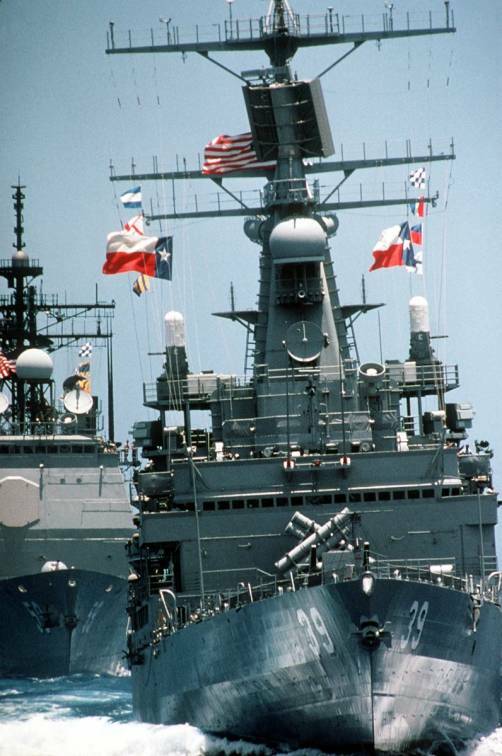 In February 1991, Texas began her sixth deployment, en route to the Arabian Sea. She served valiantly during Operation Desert Storm as the ship for the anti-air warfare commander of the Nimitz Battle Group. Additionally, she served as a mother-ship for minesweeping operations off the coast of Kuwait, providing valuable logistic support for several minesweepers. She returned to San Francisco in August of that year. In April 1992, Texas returned to sea and conducted a second counter-narcotics mission that included visits to Ecuador and Panama. Texas was placed in reserve commission on 31 May 1993, then decommissioned and stricken from the Naval Vessel Register on 16 July 1993. Texas entered the nuclear Ship-Submarine Recycling Program at Puget Sound Naval Shipyard on 1 October 1999.